BELLVILLE, Texas – They’re small, but they’re mighty. The Austin County Fair’s rodeo committee consists of just 14 members, but they care about one thing: They want Bellville’s rodeo to be one of the very best in southeast Texas every year. The annual rodeo – set for 7:30 p.m. Thursday, Oct. 11-Saturday, Oct. 13, at the Austin County Fairgrounds in Bellville – is well on its way, thanks in large part to the hard-working few who handle all the heavy lifting leading up to rodeo week. Both traits have created a solid foundation that dates back decades. Huff has been part of the group for 32 years, so he has seen a great deal in those three-plus decades. His experience comes in handy, but he knows he can lean on all the others when the time comes. From gathering sponsorships to preparing the arena, there are many tasks that take place in order to produce a world-class rodeo. Each member of the committee takes great pride in all that happens in Bellville every October. As soon as last year’s event ended, the group gathered together to begin the planning for this year’s rodeo. Teamwork is the key, and that’s the approach every person takes to each task. While some may not be comfortable working with sponsors, there are others that take up the slack. Plus, there are other things that might need attention. It’s that mindset that allows the 14 members of the committee work together as a cohesive unit. 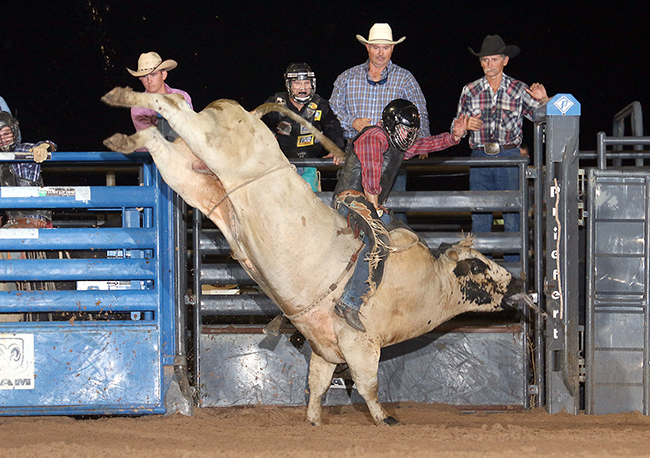 It’s why Bellville’s rodeo remains a success.